Two new LEGO Teenage Mutant Ninja Turtles Sets have been revealed. 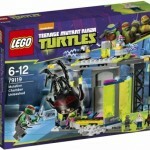 They include the LEGO Teenage Mutant Ninja Turtles Mutation Chamber Unleashed Set and LEGO Teenage Mutant Ninja Turtles T-Rawket Sky Strike Set. The news comes courtesy of Navy Trooper Fenson at Eurobricks. Turn humans into mutants in the Mutation Chamber with mutation switch and spinning electrodes. Plus Spider Bytes with huge grabbing claws. Unleash the mutated Spider Bytez against the Turtles! Uh-oh, it’s Turtle trouble! Raphael has infiltrated the Kraang’s lab and discovered the Mutation Chamber which can turn humans into mutant creatures. Climb the ladder with Victor, spin the electrodes and knock him into the mutation tank. Turn the knob to Unleash the mutated Spider Bytez against the Turtles! Stage an epic aerial battle with the T-Rawket featuring ejector seat and pizza shooter versus Kraang Ship with ooze barrel dropper. Launch a Turtle-powered Sky Strike with the T-Rawket! Green alert! The Kraang Ship is dropping mutagen bombs all over the city. Take to the skies with Donatello and Michelangelo in the Turtles’ homemade T-Rawket. Dodge the Ship’s flick missiles and return fire with a sizzling slice of Turtle Power from the p Launch a Turtle-powered Sky Strike with the T-Rawket! Check out the packaging photos of the LEGO TMNT Sets after the jump. Thanks to Brick Ultra we have a look at some of the upcoming LEGO Teenage Mutant Ninja Turtles toys for 2014. The pics shows off new versions of the TMNT Minifigs. We also get a look at Spider Bytez and Leatherhead. Read on to check out the preview pic. 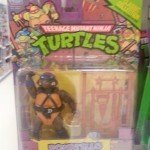 Toyark forum member Poison Shadow has found the newest wave of Teenage Mutant Ninja Turtles figures at his local Walmart. Found and pictured is the Spider Bytez figure. Not spotted, but in the same wave, is the new Shredder figure. Keep your eyes peeled and happy hunting. Last up from our Powercon Day 1 recap pics are shots of the Playmates Booth. Playmates brought a good chunk of new figures for the modern TMNT line. We get good shots of Mutagen Man, Squirrelnoid, Kirby Bat, Spider Bytez, Turtles in Training 2 Packs, Battle Shell Turtles and last but not least – TMNT Classics Bebop and Rocksteady – in package. They also mentioned Season 2 figures are coming soon! Check out all the shots after the break!